I love cooking, especially for holidays because I see it as a challenge. I try to make something healthy, without anyone noticing too much of a difference. 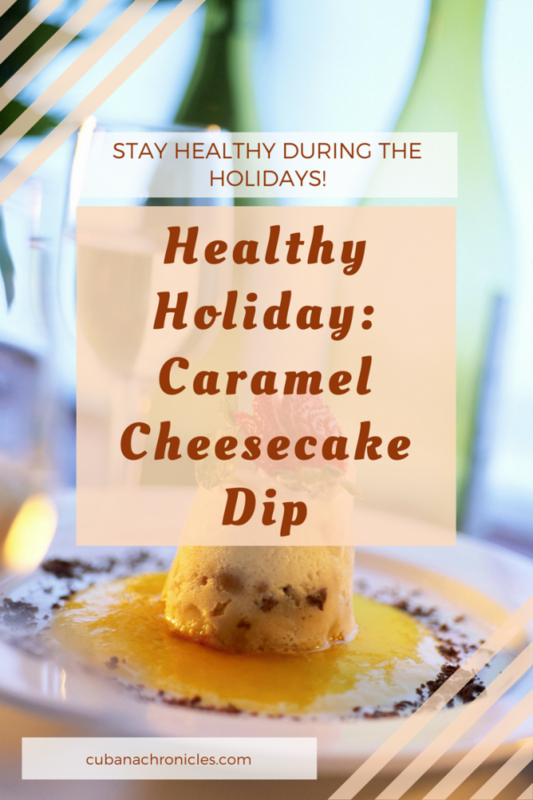 So this post is all about a healthy holiday dessert I made! I decided to do something a little different, which is why this cheesecake was turned into a dip – plus it made it easier to customize for everyone eating it! You can dip apples, pretzels, vanilla wafers, cookies – anything! I know this sounds like a lot of vanilla, but bear with me – it’ll be great! Whisk – unless you have a hand blender, I don’t! Now that all that is out of the way, we can get to the fun part! Luckily, there isn’t a ton of skill needed to make this – you just have to be good at mixing and have some determination haha! I started by adding the packages of the neufchatel cheese into the mixing bowl and the nonfat green yogurt. I found that using a spoon was easier to break down the cheese and yogurt and then I switched to the whisk to be more thorough. Next, I added about 1 teaspoon of vanilla flavoring to the mixture, 2 tablespoons of vanilla skinny syrup, and mixed away. Afterwards, I added about 1/4 cup of the Walden Farms Caramel syrup in small increments and tasted along the way to make sure it wasn’t too sweet. Then I added about 1/2 tablespoon of cinnamon and 1 tablespoon of brown sugar, and added more cinnamon as I went mixing. This whole recipe was a taste-testing game, so you can’t go wrong! After a TON of mixing I slid the dip into a plastic container and put it into the fridge. When you serve it, take it out of the fridge 30 minutes to 1 hour before eating and add a drizzle of caramel and sprinkle of cinnamon – bam! Done! When you serve it, take it out of the fridge 30 minutes to 1 hour before eating and add a drizzle of caramel and sprinkle of cinnamon! In the end, the macros/calories will be 1,258 calories, 31 carbs, 103 fat, 55 protein for the ENTIRE container! I divided the calories into 9 or 12 theoretical servings. Since I had a square container, I just imagined how much people would serve onto their plates and so the calories for 12 servings would be 102 calories, 3 carbs, 9 fat, 5 protein. This doesn’t include using apples or cookies to dip, but it isn’t bad considering a slice of cheesecake can be 380 calories or more! If you want to see my struggle mixing this by hand, I have a video HERE especially since I failed to take pictures during the whole process – whoops! Nobody noticed! Success! I only heard compliments, which was a relief since I thought it might be a risk to make a dip as a dessert. Most people even dipped with Granny Smith apples into the dip instead of cookies, pretzels, gram crackers, or anything else.